Most people only tend to replace their tyres when they discover something is wrong with the current ones they have. 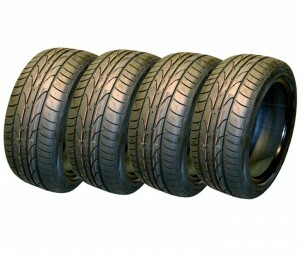 But is there a good indicator you need to have your tyres replaced, before anything goes wrong on the road? When you take your car in for a service, you will most likely be notified whether or not you need new tyres. You should also have your wheel alignment checked at this time as it too plays a part in the lifespan of your tyre. If you notice your vehicle is losing petrol quicker, not as responsive when braking or it doesn't handle as well in the wet weather anymore, there is a good chance your tyres are to blame. Take them to the nearest mechanic to have them looked at to confirm whether this is the case. Visually analyze the tyres yourself - check for any bulges, dents or signs of deflation. If you suspect your tyres are deflated, drive to the nearest petrol station and check their pressure is where it should be; the optimum tyre pressure for the average car is 32-40 Psi (or 220-275 kPa). If you manage to follow these instructions, it will be apparent when the tyres on your vehicle require a change. And when they do, why not buy your next set of tyres online?